Early Bird is a simple Game, Cute Chick is hungry to get the worm. Depending on the level the player will be given three to six strokes. Management is simple: specify the trajectory, swiping your finger across the screen. 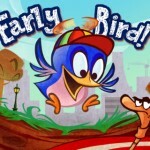 Early Bird – a game with a strong “physical” engine. As you progress through the job becomes harder and harder. In the Early Bird system is used to promote the players. Extra points (and star!) Calculated for the rate of passage, the accuracy of landing birds (the closer it was about the worm, the more points), for eating insects. The levels varied. Good graphic design deserves a word. Do not forget Early Bird and the creators of the audio accompaniment. Quiet and funny sound effects with the excellent graphics make the game really interesting and entertaining. Of course, there is support for Game Center. So we can compete with friends in the passing game. Please note that Early Bird – free of charge. There is a version of the game for the iPhone and the iPad. In general, we recommend you look at the project. 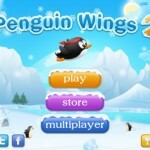 Penguin Wings 2 is a game that takes all the features of the famous Tiny Wings , but in this case the protagonist is a penguin as the title suggests. Mainly we should be able to escape from a hungry vulture who wants to put its talons on our dear penguin, all collecting as many coins as possible. We can choose to bring down more quickly or to fly our penguin with just one finger. Just started, we will be in the main screen, where are concentrated the most important aspects of the game . In the lower left is the icons to share with facebook , twitter and integration with the Game Center. In the lower right hand we find the button to enable / disable the sound, the trophy room and information. At the center there are three main buttons, one to start playing right away, to enter the store and the multiplayer. Once you press the button “play” we must choose the landscape with its level. Once you choose the level our penguin begins to slide on the ice, we must choose to let it go faster or make it fly to get the most coins.